In a city where yoga studios are nearly as plentiful as fussy coffee shops, it can be difficult to decide where to get your ‘om’ on. Some want a pristine, white box for sweating away stress. Others seek community, core strength, and a nice deep stretch. And some just want to rock out to Beyonce while burning through sun salutations. 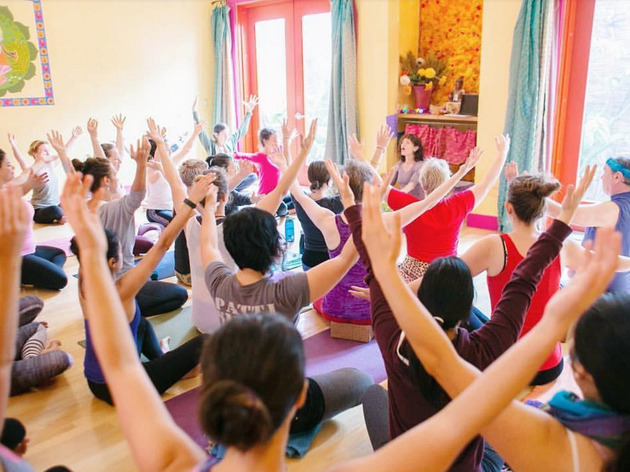 Whatever your inner yogi desires, San Francisco has a studio—and an eager instructor—for you. Here’s where to find the best bikram, vinyasa, prenatal, and restorative classes in the city. Walk-ins are welcome at this five-year-old Dogpatch studio. Run by husband-wife duo Mimi Moncier and Alan Lewis, the spot’s emphasis is on small class sizes—often 10 students or less—and individualized attention. But though the spot’s 60- or 90-minute classes are intimate, the light-flooded space is luxuriously spacious, decked with globe lanterns, fresh flowers, and colorful drapes. The crowd is arty and creative; Lewis is a working architect and Moncier is an exhibiting artist. Giggling Lotus teachers adapt vinyasa and hatha flow styles, but slower-paced yin classes—as well as pre- and postnatal variations—are also available. Drop-in for a weekly meditation class for just $5. 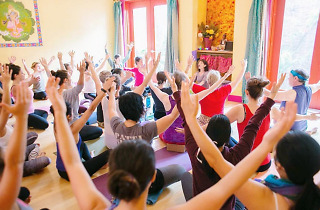 Yoga to the People is a bi-coastal institution, with studios in Manhattan, Brooklyn, Berkeley, and San Francisco. It’s easy to miss from the street level—hit the buzzer to be let up or just look for spandex-clad yogis on their way out the door. But the 5th-floor understated entrance belies the stunning space, fronted by a wall of windows overlooking the city. Wood beams overhead and scattered plants lend a warm, welcoming feel. (The studio is also kept quite warm—literally—thought it’s not hot yoga.) The studio’s motto, “no ego, no script, no pedestals,” is aptly reflected in its by-donation model. The body-positive vinyasa classes are vigorous, but unintimidating, focusing on the interplay between movement and breath. Need a distraction from a shaky pose? Teachers often play modern tracks, from reggae to indie rock to electronica. With its charcoal-gray walls, complimentary towels and water, and moody lighting, this candlelit hot yoga studio feels unusually decadent. But the steep prices—$30 for a walk-in class—are the effect of a comparably novel business model. Rather than being paid as independent contractors, yoga teachers here are full-time, salaried employees with health benefits, vacation time, and sick days. The upgrade is apparent in the quality of the instruction—every class is staffed by two teachers, one for demonstrating, and one who cycles through the room to give one-on-one support and feedback. The fast-paced flow is synced to energizing soundtracks chosen by each teacher. In one class, you may hear ‘90s hits; in another, pulse-pumping remixes. 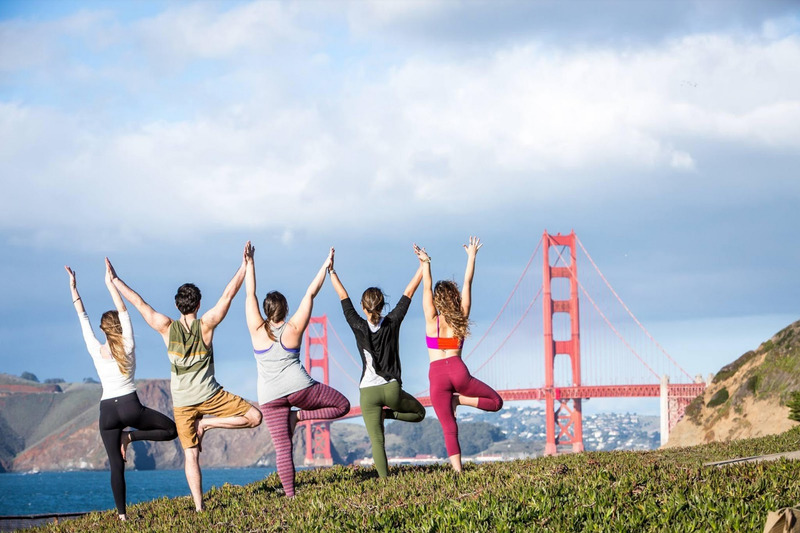 Founder Gizella Donald has been practicing yoga in San Francisco since the ‘90s, and the community feel is apparent, from the friendly staff to the post-class mingling around the tea station. She founded this studio in 2008 (and since added a second location in Noe Valley), offering heat-building vinyasa classes tailored to build endurance, flexibility, and strength. Advanced classes work on arm balances and inversions, while yin and mellow flow classes foster concentration and balance. Several of the instructors are former dancers, which means there’s a gentle emphasis placed on proper form and an innate sense of varying capabilities.